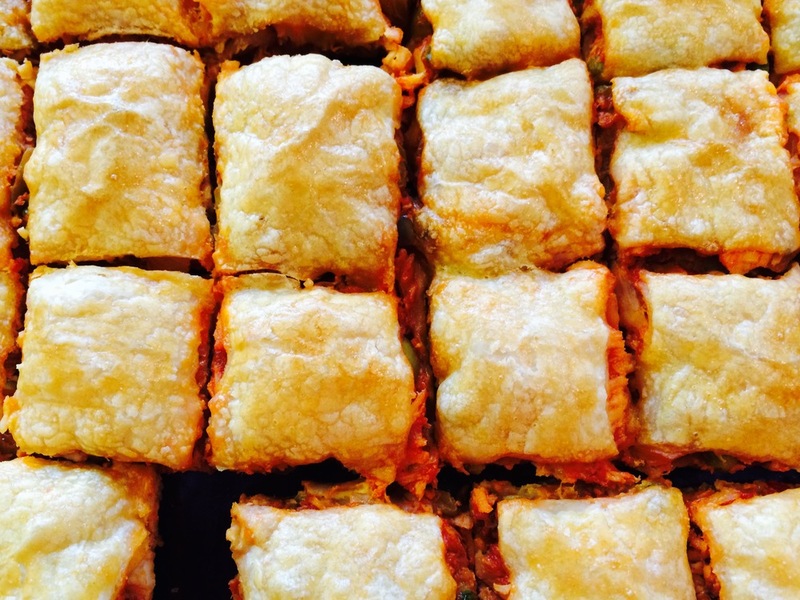 This is a Cuban chicken dish in a puff pastry. In large skillet, sauté onion, bell pepper and garlic (sofrito mixture) in olive oil for about 5-6 minutes. Add tomato paste and white wine, cooking over low heat for 5 minutes. Add cooled, shredded chicken, mix well, and add rest of ingredients, cook another 5 minutes. Line cookie sheet with parchment paper. Unfold one pastry sheet onto pan. Spread chicken/sofrito mixture all over pastry. Unfold 2nd pastry sheet and place on top of chicken. Brush egg wash over top of pastry. Cut into squares BEFORE baking.